The same as for the back raise. In this exercise there is also shoulder rotation to the rear which uses the same muscles but in a rotary action. In addition to the sports uses listed in the section on the back raise, the backward twisting movement after the back raise can give an even a greater ROM in forward trunk rotation as occurs throwing and hitting actions. 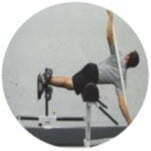 Developing the backward rotational action of these muscles creates a stronger stretch of the abdominal oblique's. It also helps to provide greater stability and movement potential in the midsection. The main value of this exercise lies in the twisting. Because of this it is not necessary to always go to the lowermost position. When the muscles are stronger, that is, you have strengthened the erector spinae muscles sufficiently, you can hold yourself level (horizontal) and then twist alternately to the right and left.